Join Gallery Voices for a morning filled with music and merriment! Celebrate the arrival of Spring at the annual Friends of the National Arboretum (FONA) Garden Fair and Plant Sale. 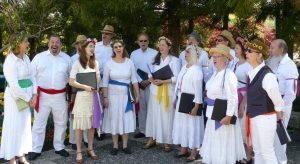 Washington Revels Gallery Voices will entertain with timeless madrigals and some traditional Revels songs for a day of celebration. And that’s not all — we will dance the Maypole several times and invite fair-goers to join us in more Maypole dancing. Don’t miss this annual tradition and, while you’re at it, pick up some wonderful green stuff for your garden. Gallery Voices will be roving the Arboretum grounds between 11 am and 2 pm.